I just noticed today that the automated announcements system on the Muni buses are stating a new message about possible service cuts and fare increases and is also announced in Chinese (Cantonese or Mandarin?) and Spanish. OK... so what does this have to do with anything? If Muni can afford to pay a Texas firm known as DRI and Donna Reed who is the "official voice of Muni" to make the new announcements about cuts and fare hikes, how in the hell did the agency not pay to revise the many mispronounced street names? Sansome is supposed to be announced as San-Some, but the system still says San-SOH-Me. I remember Muni doing updates before these massive re-routes and revised announcements project. 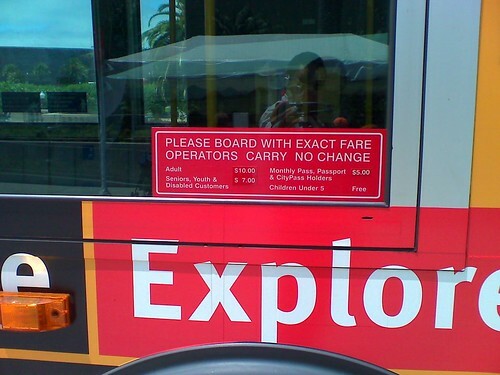 Some bus lines had terrible pronunciations and was revised with a male announcer who spoke the stops correctly. One example is the 47-Van Ness. Even then, Muni only had to make announcements on major stops, such as major intersections and transfer points, and was never required to announce the other less frequently stopped locations. But with Muni spending dough to announce every single bus stop, every single mispronunciation makes the agency look like a bunch of idiots. I can't still believe that major city attractions, colleges, universities, and public schools were removed from the announcements system; so how will tourists know when they reach a certain attraction? Ask the grumpy driver? I'm still frustrated at Muni for not fixing the announcements system for the 18-46th Avenue line. Now that the line is re-routed to serve Balboa from 33rd Avenue to La Playa, the announcement system is making announcements of stops that used to exist when it operated on Geary and Point Lobos. For example, the re-route stop at 43rd Avenue is pronounced as "Merrie" (a.k.a. Cliff House). UPDATE 2/12/10: Muni did a half-assed job on modifying the 18-46th Avenue announcements. The verbal announcements are now correct, but the visual announcements are still mentioning the old route stops along Geary/Pt. Lobos. Example: 47th Avenue and Cabrillo verbally says "47th Avenue" but the visual sign says something completely different. As a Chinese-American, I can confirm that the message about possible service cuts and fare increases is announced in Cantonese. Agreed... Cantonese - I have never heard any MUNI announcements in Mandarin. Presumably, there are more Chinese folks who speak Cantonese than Mandarin in the City.